"I'm so down because of the budget," Cortines said before his speech on the state of the District. "I've gone through line by line twice, and I can't balance it yet. I've got to be upbeat but I'm not feeling that." Sure you can't balance the budget, because you exclusively rely on the entrenched LAUSD bureaucracy to tell you what the line by line budget entries mean. Ray, they're not telling you the truth! As a person with years of experience dealing with multi-million dollar budgets in the motion picture industry, real estate, and the law, I offered to help your Chief of Staff Jim Morris balance your budget -- he declined -- so I'll offer again in case you didn't get the message. Why not get rid of the television station and the 8 local districts -- their bureaucracies were always of questionable necessity -- but are now surely a waste of precious resources when balanced against the teaching that takes place in a classroom with one teacher and a reasonable number of students (preferably way under the present District acceptable 43+ to 1). Needless to say, the empty space at 333 S. Beaudry would be more than enough to accommodate the bureaucratic members that truly needed to remain. Authority exists under the California State Education Code to hold students accountable for the vandalism they do at school, but are never asked to repair. Students who have to clean up and fix their own vandalism might just be more likely not to commit it in the future. Hell, they could also get some employable skills that might keep them out of gangs and jail when they finally get out of school. LAUSD is the largest customer of AT&T in the county of Los Angeles and yet it does nothing to try and lessen its costs by doing things as simple as: changing the way it is billed, using Internet telephone systems like Skype that are either free -- when calls are made from computer to computer -- or significantly cheaper than AT&T when paid for by yearly subscription. Given that LAUSD has expensive T1 connections going to virtually all of its schools and work sites, eliminate the thousands of dedicated fax lines by having faxes go directly from computer to computer -- this would also save a fortune in paper for the vast majority of faxes that wind up in the waste basket. Before shortening the school year for students and employees by four days, which is projected to save about $90 million, eliminate all faculty meetings and staff development. The majority of what is discussed at faculty meeting could be handled by email or by presentation online during a teachers conference period. It is hard to develop a professional staff of teachers while simultaneously degrading their collective bargaining agreement, cutting their hours, and laying them off. Superintendent Cortines "also noted the need for much higher graduation rates, among other challenges. And he said he won't settle for excuses." Come on Ray, how realistic is it to think that we're going to cut the hell out of the budget and still have much higher graduation rates? LAUSD recently had to come up with more benefits for the cafeteria staff, because they needed to have their hours extended to adequately serve the student meals. In a district like LAUSD with greater ethnic diversity than probably anywhere else on the face of the earth, what would happen if we started to phase out food service employment as people retired and replace them with real vocational student food service classes? It would probably look something like this. Rather than propose a new parcel tax, which will be virtually impossible to get passed, why not put a measure on the June 2010 ballot to amend the presently restricted $19.5 billion school construction and modernization program, so that its proceeds could fund other services that are more relevant? Cortines wasted $77 million on construction consultants in just one year alone. Much of the capacity of the 150 new schools that LAUSD is building is unneeded and something as simple as staggering the start times of existing LAUSD schools is a far better solution. Starting school later and keeping them open until 10PM would attract some of the working student population that has dropped out and perhaps parents who want to improve their own education, so that they might be more gainfully employed. Parents who can support a family with one job and not three, might be able to keep their children away from gangs. "Board member Galatzan cited unlikely prospects as one reason she cast the dissenting vote" for the parcel tax proposal. "She said the district also should focus more on structural reform before going to voters for more money." Board member Galatzan couldn't be more right. Why would anybody give more money to an entity like LAUSD that shows it doesn't have a clue how to fix its systemic problems. In the real world, if you are not deemed "too big to fail," like Wall St. and the banks -- don't get me started -- you probably have to go through bankruptcy or foreclosure like the rest of us. At best these procedures allow non-productive assets to be acquired by others who might have a better idea how to pragmatically run a public education system. Can any of you out there contribute some other potential budget cuts that would leave education intact while cutting some more of the fat out out LAUSD? "....why would you think a two-thirds majority of taxpayers would support a $100 a year property tax for 4 years to sponsor a failed school system that many don't use and more wish they could escape from -- if they weren't so poor?..." "...The California Majority Rule campaign is presently circulating petitions to place an initiative on the California ballot for majority rule- that is for democracy. California is in deep trouble because it has a anti democratic limits on the legislature (sic). Lakoff sent to the Attorney General a ballot proposition for the 2010 ballot called The California Democracy Act. All legislative action on revenue and budget must be determined by a majority vote..."
"...For a median-valued home within the district, the cost [for the bonds] is about $675..."
My question is this: Will there be any taxpayers left to pay for the bond? And, will the last taxpayer fleeing the state please turn out the lights. Long an Art teacher in Cal Ed up here in Sac, I empathize totally. The finest of my compatriots (all political persuasions) have spontaneously said in many ways that Cal Ed is too corrupt, too failed, too dysfunctional to adjust or repair itself. It must collapse and be rebuilt. It cannot survive. Only the past 'feel good' dreams from the past in the minds of the people keep this monstrous boondoggle alive. The corruption is too deep, too advantageous to entrenched edu-criminals of all descriptions for them to allow for 'correction' which would take billions from their collective pockets and restore those billions to classrooms and to The People. 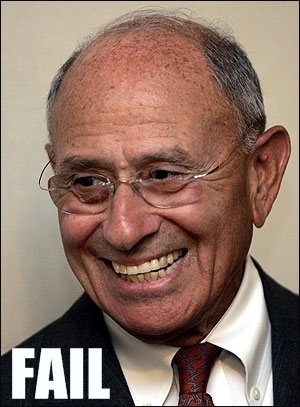 Mr. Cortines leave LAUSD now! Also wanted to follow up. Author did a good job with some cost cutting but the whole paradigm here is one of top down control. Faculty mtgs: Faculty mtgs in other districts in LA, Riverside or Orange County are rare. They use email with a return receipt for stuff you should have (which is read to you like you're an idiot at LAUSD) and professionally dealt with. Mtgs in other school districts are used for vital things that you cannot read. Here it is a means of control. Professional Develpment: In other districts they bank their time better. They meet as a district and share ideas that work. Good cross pollination of ideas. Here we hire vendors who are buddies and pals of administrators. Usually former administrators themselves, these trainers haven't been in a classroom for years, and all speak the same buzzwords and teach the same... but they get paid! In the untenable classroom environment of LAUSD, assaulted teachers think of faculty meetings and staff development as R & R from the combat zone that most school classes have been allowed to degrade into by non-supportive untenured administrators in their monomaniacle pursue of ADA and the jobs at any cost that they bring. Pursuit of excellence might go a great deal further in getting some of the presently hard pressed Whites to put their children back in the local public school across the street. It might also have the collateral benefit of lessening the nightmarish Westside traffic jams in the mornings- just ask Chief City Planner Gail Goldberg. Funding the classroom is not this district's first priority. Real estate, supplies, construction contracting, legal, vendors, etc. are. If a student happens to get educated here that's a nice side benefit. Compared to other LA county school districts like Garvey, ABC, others, we have the highest percentage of administrators to teachers. Our administrators are among the highest paid in the state, and we have one of the highest numbers of out of classroom personnel per teacher. All of that supervision bought increased failure. Funding the classroom isn't important. Been to Beaudry? Seen the nice, new furniture, computers, nice, clean spaces? Contrast that with the often moldy, dark (because someone won't change the light tubes) broken 1950's era furniture in the classrooms? It couldn't get any clearer. Notice Cortines. His first instinct under the budget crisis is to cut teachers and the classroom. Lay off teachers, cut their pay, and hack 6 days from students. He admitted as much last year. Contrast this with other districts who are interested in educating kids. Their cuts come elsewhere. People hope beyond hope that somehow, someway if we just make Cortines understand... we can fix it. YOU CAN'T. Cutting bureaucracy means cutting friends and cronies. He understands fully. People expect this man to act honorably. Why? That's not his record. He just got caught with his hands in a vendor cookie jar to the tune of $150k. What other cookie jars is he in we don't know about? Anyone? WE don't know, do we? The press isn't interested is it? This guy is no savior, no saint. When he was last here to "cut the waste" in 2000 it grew tremendously - the mini district was his baby.